NXTER.ORG’s RubenBc interviews Roberto Capodieci, who is the CEO of DeBuNe (Decentralised Business Network) and OTDocs.com (Open Trade Docs) and also the Founder of TheSoundKey.com + Go.Notifile.me. Roberto has extensive experience in the IT and business sectors. At age 10 he developed and sold his first video game, began his IT entrepreneurial career when still in his teens and at 20 years’ old was running an office of almost 40 developers and software engineers. On January 16, 2015, he announced DeBuNe in Nxtforum and 10 days later began a successful fundraising campaign. Roberto sees himself as a farmer with a seed in his hand (DeBuNe), a good fertile field to plant it in (Nxt) and needing only some more water (investors) to be sure of a bumper harvest. RubenBc: Roberto, I’m delighted to be speaking with you and look forward to learning about the technology that you’re presenting to us. First of all: What is DeBuNe? Roberto: Thanks Ruben – it’s great to be chatting with you. Basically, DeBuNe was born with the aim of decentralising business processes. More specifically, putting business processes on the blockchain, delegating the execution of pre-agreed decisions to smart contracts and phasing transactions. DeBuNe therefore enables entrepreneurs to put the administrative aspects of their business relationships on auto-pilot. This of course means they can then focus much more on the aspects of their work that require their key skills. RubenBc: What types of project are currently running on the DeBuNe platform? For example, OTDocs. This was the first project to use DeBuNe decentralised business process solutions to help manage documentation in international trade finance. We’re currently working on proof of concept pilot projects with several banks in Singapore and Australia. Another of our projects is TheSoundKey; this is a small hardware device you can use to digitally sign blockchain transactions while making sure your digital identity is absolutely secure at all times. Last, but not least, our latest project – my favorite and for sure the best – but it’s still top secret! One of the four versions of this project, http://go.notifile.me, will run on the Nxt blockchain, and will hopefully help to keep Nxt alive! RubenBc: Do you require a new financing round? If so, will you be making use of the Nxt platform to raise the finance? Roberto: The short answers are: not yet and yes I expect we will be doing so but only when the time is right. Nxt of course is not only a platform, it’s also a community and it was the amazing enthusiasm and support of the Nxt community that gave me, and the rest of the team, the courage to drop everything else and focus 100% on DeBuNe and collateral projects. The funds which we raised initially represent less than 10% of what we ourselves have invested so far. The income generated by the DeBuNe projects is distributed according to asset ownership which in practice means that approximately 25% is distributed, as revenue share, via the Nxt platform, to the individual asset holders and the rest is retained by DeBuNe to cover the running costs. This is why DeBuNe will never put up for sale in the market more than 50% of the total amount of assets. To support our efforts we have started offering consulting on blockchain projects, and implemented a couple of solutions. We are now hoping with our most recent (and still top secret) project to generate some fast income, and at the same time we are closing some paid pilot projects with some banks in Singapore. We haven’t yet accepted any seed fundings with our startups because, before we sell any equity to investors, we want the companies to be worth as much as possible. In this way we’ll be able to raise the necessary finance without having to give away too much share capital. RubenBc: I’ve read some of your articles, blockchain technology clearly fascinates you and specifically the Nxt blockchain…. How do you think DeBuNe can change the way a business is run? Roberto: Through data decentralisation, combined with the use of digital signatures and thus identities, secure “timestamping” of transactions, non-repudiation, and pre-programmable actions. These are all key aspects of how DeBuNe can prevent business processes from being manipulated by any third party. Two other things are needed. First, a reputation management system that lets everyone know how much trust they can place on a user via his digital identity (i.e. their public key on the blockchain with which they sign all their digital transactions). Second, coupled with that, a good decentralised KYC system which ties a person’s or company’s real identity to their digital identity. Together these two things will empower people and companies all around the world to do business with each other, regardless of where they are located, or what prejudices other people may have of them or indeed they may have about other people. RubenBc: What Nxt features are you using? Roberto: We pretty much only use the messaging system and sometimes the Alias System. We may consider the use of Phased Transactions. RubenBc: We have started 2016 with a remarkable increase of confidence in the crypto ecosystem thanks in part to the prospect of another large crisis in the financial markets. 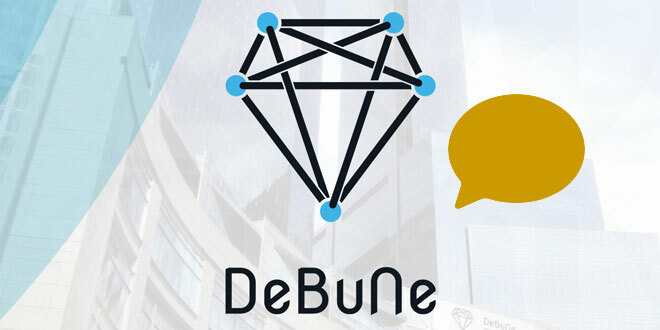 What will happen with DeBuNe during 2016? Roberto: DeBuNe will take time to release a finished product, due to several legal and practical (funding) reasons, but it has opened the doors to the means to get there. DeBuNe sub products will see the light of day this year, and I am very confident that they will succeed! RubenBc: Do you think that the growth of Nxt’s adoption and other cryptocurrencies will be constant, progressive or will there be an event which will make it grow exponentially? Roberto: As with any new technology there is a huge need for education in order to gain adoption. At the moment though, the “blockchain” is just a buzz word and every financial institution thinks it needs to have a project involving one, even if in most cases they have not much idea of what it means. And, at the other end of the supply chain – the end users – don’t even know what they are using. I recently overheard someone expressing his surprise that to use Facebook he needed an Internet connection: to him Facebook was an application on his phone, and had nothing to do with the Internet. It will therefore very likely take a few years before this person understands crypto platforms! Read more about Roberto Capodieci and his background + blockchain visions in the The First Nxt Book (to be published in late February/early March 2016). Nxt Foundation has joined Linux Foundation and HyperLedger!